This is a good full-court drill that emphasizes transition offense and defense as well as conditioning. We have two teams, and we keep score with losers running or doing pushups at the end. First we start out with the 3-on-2 drill. See the diagrams below. Diagram A shows the defense in blue, offense in yellow. X1 passes to either O1 or O2 and the drills starts. X2 starts under the basket. 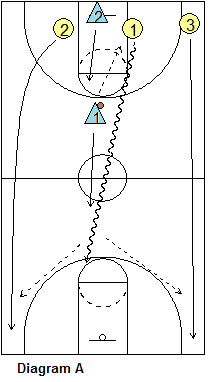 After the initial pass, X1 and X2 sprint back to set up their 2-defender transition defense (diagram C) with one stopping (and calling) the ball and one under the basket. The defenders must communicate. 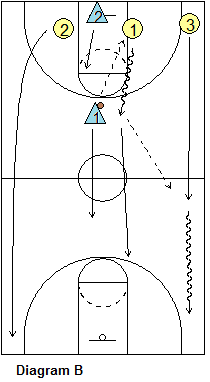 If the ball is passed to either wing, the low defender closes-out on the ball and the top defender drops to the basket (diagram D). On receiving the pass, O1 speed-dribbles up the court (diagram A) and could attack the defense with the dribble, or pass to either wing. The wings O2 and O3, sprint wide up the sidelines all the way to the baseline and spot up for the in-transition 3-point shot. We don't want the wings to get inside the 3-point arc and take a long 2-point shot. We want wide spacing. The exception is seen in diagram C. If we have a natural post player who is not a good outside shooter running one side (here O4), O4 initially runs wide and then cuts along the baseline right under the basket and posts-up on the ball-side, here looking for the pass from O2. 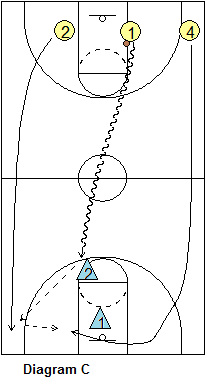 On the initial break-out, O1 could pass up the court to either wing (diagram B). 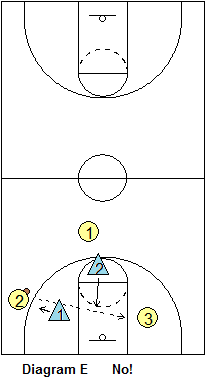 In this case, we want O1 to fill the top spot on the ball-side, so that the reverse pass to O1 is in order. 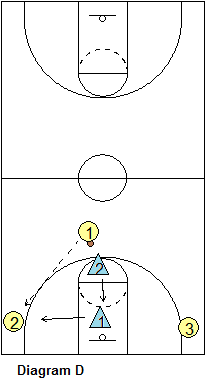 Diagram E shows a common mistake made by the offense... the wing player with the ball will sometimes try to force a cross-lane pass to O3. This is considered a "no-no" by us as this pass is frequently intercepted because defense is dropping in the middle right into this passing lane. Remember to coach the shot-fake when the low defender flies out to defend the wing-corner 3-point shot. If the defender does not close-out correctly (leaves his/her feet to block the shot), give the shot-fake and dribble around to the hoop. After a score, or a defensive stop, play ends and the next group at the far end starts. Keep score.